If you are in the market for an electric cordless kettle from a reputable brand that has all the important features and does not cost an arm and a leg, then the Hamilton Beach Stainless Steel Electric Kettle 40894 – 10-Cup might be just what you are looking for. 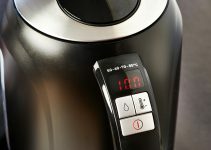 As the name suggests, the 10 cup kettle can efficiently boil 10 cups of water in a matter of minutes. While the physical design of the kettle is impressive, its core design is also equally well done. The body and the spot are made from stainless steel, meaning that is designed with durability in mind. The capacity to heat up water faster than a microwave; the kettle is also safer to use compared to a stovetop kettle. The kettle is cord free, which makes it easier to pour your beverages. It also means that it can be transported easily from the counter to the table. The heating element is concealed which makes it easier to clean. Advanced features include auto shut off, which prevents the kettle from boiling dry. It has a red light indicator that notifies you when the kettle is already in use. 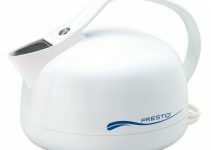 Since the kettle is cordless, it is easy to use as the cord is located at the base. The handle offers good grip that makes it difficult to slip while serving. The handle in the cordless kettle stays cool even when the rest of the kettle is super hot. The automatic shut off feature ensures a high level of safety and it also helps to avoid over boiling water. This kettle is affordable and it can boil water in minutes. 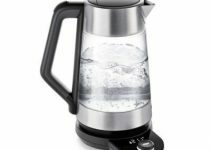 This is an all purpose kettle, which is aesthetically appropriate for use practically anywhere; it is safe, fast and boils water faster than most competing models in the market. The kettle is not embedded with a whistle indicator. The kettle produces some noise when in use. This 10 cup kettle can be the perfect addition to a household that has many occupants. It is also great for having while you are traveling. Some of the impressive features like the powerful rapid boil feature allow the kettle to heat up from any standard outlet. Additionally, the auto shutoff function, which prevents the kettle from boiling while dry, makes this kettle that much safer to use. This kettle can be closely compared to the Hamilton Beach 40880 Stainless Steel Electric Kettle. They have exactly the same features, the only difference between the two is the removable filters. The 40880 has a removable filter. This Hamilton Beach cordless electric kettle 40894 is definitely up there in the list of must buy kettles.